Click the map image to view all open space properties. Bellamy Preserve (81 acres) has trails that wander throughout the property. Access and parking are located on Munger Lane in the center of Bethlehem. Two Rivers Preserve (11.4 acres) has a scenic path along the river from the parking area. It is located on Route 132, approximately 1.5 miles west from the center of Bethlehem. Long Horizon (4.1 acres) has a trail that meanders along a ravine, around the field and through a young arboretum. It is accessed through the town-owned Swendsen Farm Preserve or from Long Horizon Road. B. Earl Canfield Jr. Preserve (31 acres) is on the southeast side of Still Hill Road downhill from the last house; there is parking at the bottom of the valley. Trails coming soon. 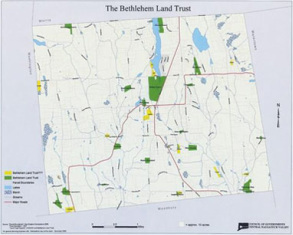 The Bethlehem Land Trust holds 359 acres in permanent preservation. Of these, 17 parcels are owned by the Trust and 7 parcels are held in Conservation Easements.